There is a plan to enclose some of forest areas to protect them from fire and prevent uncontrolled grazing of livestock, Employee of the Ministry of Ecology and Natural Resources Sadig Salmanov said, Trend reported. He noted that worldwide, the main cause of wildfires is the human factor. “The proof of this was the strong fires that occurred in Greece and California last year. Unfortunately, last year forest fires occurred in Azerbaijan due to the negligence of people. Therefore, in certain areas of the forest, fencing works are being carried out. Fencing in the forests will be carried out only in the necessary places. We are talking about a natural fence on a small area. This will protect the new areas planted, protect against fire, speed up the natural restoration of forests,” Salmanov said. Salmanov added that this experience is used throughout the world. This is also provided for in the recommendations of the Food and Agriculture Organization of the United Nations (FAO) for the development of the National Forest Program. Earlier, the ministry official also informed that five cameras have been installed to protect forest resources. "15 more cameras are planned to be installed in the forests this year and works in this direction will continue in the future,” Salmanov emphasized. Generally, forestry in Azerbaijan is a major environmental resource and plays an important role in the life of people, especially in rural areas. Forests support human well-being in many ways, including timber production, wildlife habitat, air quality, soil protection, carbon storage and recreation. The forests tend to cause abundant and needed rainfall and to preserve the moisture when fallen, releasing it to the rivers gradually, and thus preventing abnormal freshets and extreme droughts, which is very important factor for the agriculture development. Preservation of the nature and biological diversity is one of the basic priorities of the state policy in Azerbaijan, and large-scale state programs directed to the improvement of the ecological situation have been implemented during the past decade. 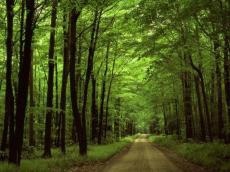 Over the past few years, the forest area in the country increased from 11.4 to 11.8 percent. Over the past decade, the number of protected areas, national parks and nature reserves have increased significantly in Azerbaijan, which is very helpful to prevent the deforestation. However, occupation of the 20 percent of Azerbaijan’s territory by Armenian military forces caused a significant damage to the forests, especially those located in the mountainous areas.